On Wednesday Todd declared, “Tomorrow is Lolo Day.” Lolo is Soren’s nickname for his much-loved nanny, Myrtle, a woman certainly deserving of a holiday. 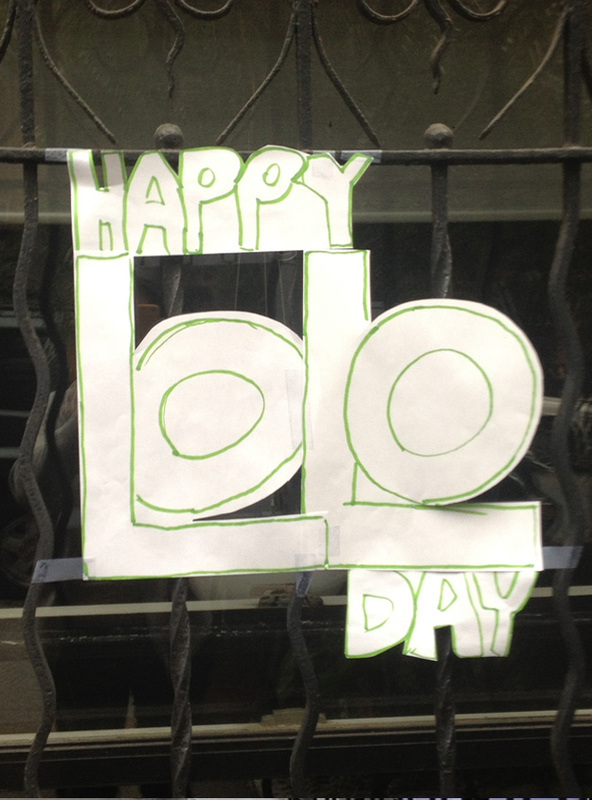 My heart kinda melted as Todd took it upon himself to make a card of appreciation, pick up a gift certificate to one of her favorite restaurants and create a sign to hang in the window for the entire day, Lolo Day. Entrusting your child to another person is one of the many lessons in letting go that punctuate the story of parenthood. So there we were with a three-month-old for whom we barely had the operating instructions figured out, interviewing women, many mothers themselves, about caring for a child. What did we know? We went with Myrtle, a mother of two girls, who had worked for years in the neighborhood and knew her way around every sing-a-long and story time within a mile of the house. I was so anxious that first day returning to work (how to fit in two morning feedings before leaving the house, what to wear, where to pump, is my sleep-shot brain up to this). Not to mention just walking away from a house and a baby that we were turning over to someone we’d only just met, even if she did come highly recommended. As a parent you agonize over any little disaster that could happen off your watch. I raced home that night to a sleeping baby, an immaculate house and dinner waiting for us. I wept with relief, and I’ve felt relieved ever since. And grateful. We were incredibly fortunate to connect with Myrtle and her family. Over the past two years we have slowly learned what she and her husband sacrificed – including leaving their older daughter behind in their home country for a few years – while they established a more promising life for their family in New York. Myrtle came here and cared for other people’s children while she was separated from her own. And I was worried in those early weeks about leaving my son for eight hours a day. I can’t even imagine. Myrtle was so surprised and touched by Lolo Day that it was fun for all of us. So appropriate your own holiday in honor of someone important in your life. It’s easy – a homemade sign and a plate of cookies is all it takes – but the impression is lasting. This entry was posted in create and tagged holiday by lhouse. Bookmark the permalink. What a fantastic idea! Todd serves as a great inspiration to remember to be kind and generous of heart. this is such a great idea and a lovely post.